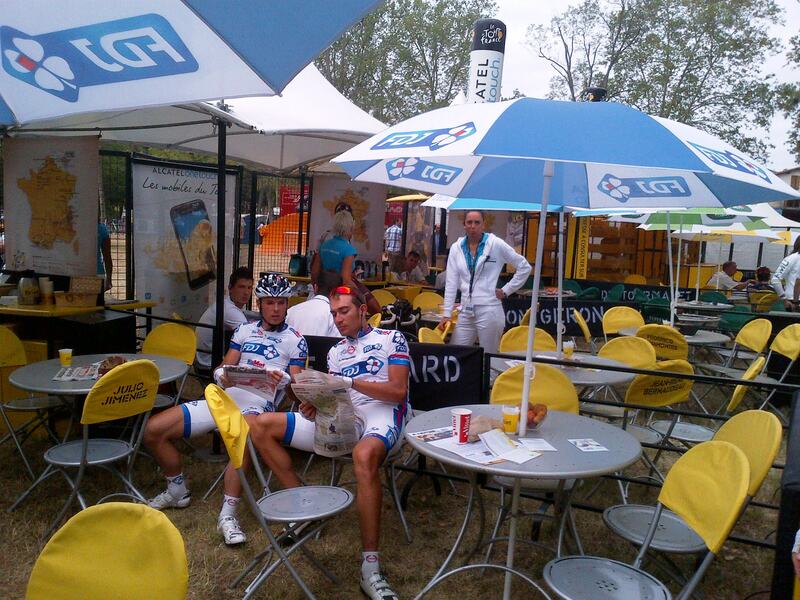 A day at the Tour starts early as we always aim to arrive at the Village du Depart just after it opens. Each day, the Village plays host to the guests of the sponsors and the host town and, to a lesser degree, the teams and riders. Upon arrival, we grab a late breakfast and the free newspapers to check what’s been written in the press before developing the day’s filming strategy. This is the time we sit down and determine who we want to speak to and what we’re going to ask them. 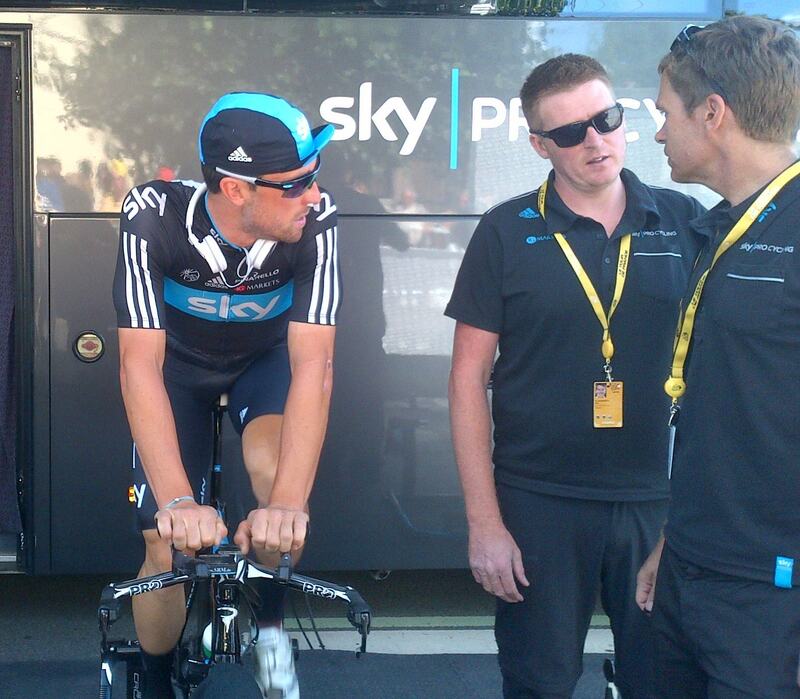 As anyone who is a regular viewer of the Tour knows, all race footage is provided by the host broadcaster. Television channels around the world then seek to animate their race offering with a selection of pertinent pre-recorded and live interviews throughout the day’s stage. This means everything tends to be done very much ‘on the hoof’. Having selected the targets for the pre-stage recorded interviews, we then trot around to the team buses to check on their availability. This is the first challenge – chances are everyone wants to speak to the same teams’ managers, directeur sportifs and riders and the media descends like a swarm of locusts on their prey. It’s no wonder the riders seek refuge in the team buses! A few of the riders, generally the French riders whose teams are sponsored by companies who also support the Tour, mingle with guests in the Village. To secure your man requires determination and sharp elbows. Once we’ve secured our quarry, we briefly explain what we will be asking him so that he has a bit of time to think of something to say. Generally, the short but pertinent questions will be about the previous day’s results or the likely outcome of the day’s stage. While an encyclopeadic knowledge of the rider’s palmares isn’t mandatory, it certainly helps, as does an ability to speak a number of languages. Those that haven’t been run to earth at the bus can generally be tracked down at the sign-in or while they’re waiting for the depart fictif (the processional parade out of the start town before the actual depart). It really is a case of persistence paying dividends. As soon as the peloton leaves, we return to the technical area to review the morning’s shooting. A quick comfort break, some fruit for the journey, then it’s into the car and off to the finish by the designated off-course route – an impressive cavalcade of Tour followers. On reaching the host town for the finish, we navigate our way through the chicane of barriers, which effortlessly open for the car’s accreditation stickers. First things first – lunch. In France this is typically 12:30 – 14:30, but this isn’t France, this is the Tour de France and so it’s whenever you get time. The television crews have a chow wagon that would put many a celebrated restaurant to shame and I would defy anyone to eat lunch here every day and not gain a few kilos by the end of the Tour! Lunch isn’t leisurely though as we need to get to the television crew and support staff in the technical area directly behind the arrival line to watch the action unfold on the screen. Hopefully, we picked right and that morning’s interviews have included someone who’s currently animating the stage. The post-race interviews, however, are ‘live’ and therefore require far more co-ordination. 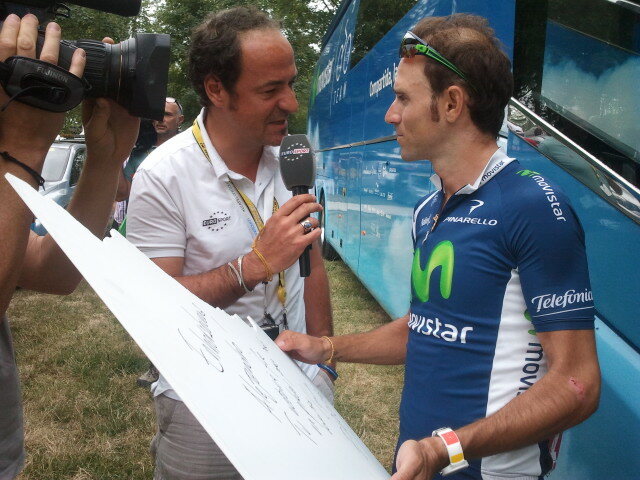 Every man and his dog wants an interview with the stage winner. Live interviews after a time trial are easier since the riders arrive largely one at a time, but the scrum around some of them has to be seen to be believed. Frankly, I’d be tempted to keep on pedalling but riders are obliged to stop in case they’re required to pay a visit to doping control. There are more opportunities for interviewing those who will be making the trip to the podium. However, you need to be fleet of foot to catch those whose dreams of victory were snuffed out on the line – and they tend to be less inclined to talk. Live interviews are demanding for all concerned – you don’t have time to brief the rider and you have the director screaming instructions and questions into your earpiece. It’s stressful for everyone! So, stage over, day done, right? Not quite, post-race segments still need to be filmed. Eurosport makes use of a number of well-known former riders who act as consultants, giving their opinion on the day’s action and their predictions for the race. The segment will generally include an interview with one of the riders who animated the day’s stage, one of the leading riders or perhaps a visiting personality. These are quickly choreographed and shot live. 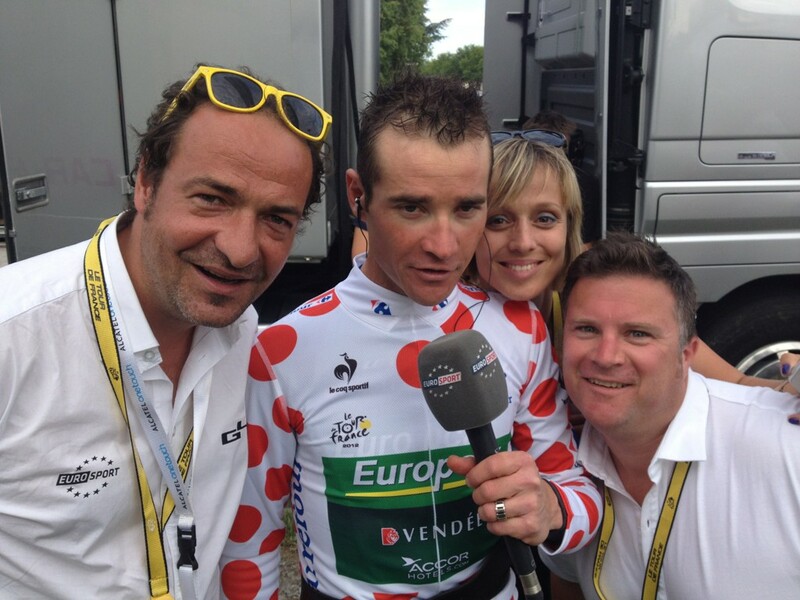 On the Tour’s penultimate day, the guest was the French public’s darling, KOM Thomas Voeckler who, having recently completed the time trial, fell on my homemade pain d’epice like a starving man and ate an enormous slice with evident relish – that made my day. There’s usually a large crowd for these interviews, again on the other side of those barriers, so I try and make someone’s day by collecting autographs from the various riders and former riders, who are more than happy to pose for photos. Stage and filming wrapped, everyone relaxes over a cold drink before packing up and heading back to the car for the drive to that night’s hotel, which might be 50km away or 200! On arrival at the hotel, we immediately head for dinner with the gang which can number anywhere from five to 15. Dinner’s usually a convivial affair with everyone swapping tales of their day and sharing gossip from the peloton. Tomorrow’s departure time from the hotel is a function of how far we have to drive and when the stage starts. Dinner over, it’s back to the hotel to check that we have sufficient clean clothes for the next day. The Tour is a month-long affair for everyone (including pre- and post-Tour days) and it’s simply not practical to bring a change of clothes for every day, so you tend to bring your most versatile and hardwearing clothes. It also means there’s usually a spot of laundry before lights out. In the morning, it starts all over again. Just like Groundhog Day.